About 100 homes have been evacuated in Louisiana after a derailed train carriage leaked toxic chemicals. The railcar leaked sodium hydroxide, which can be lethal if inhaled, a Union Pacific railways spokeswoman said. 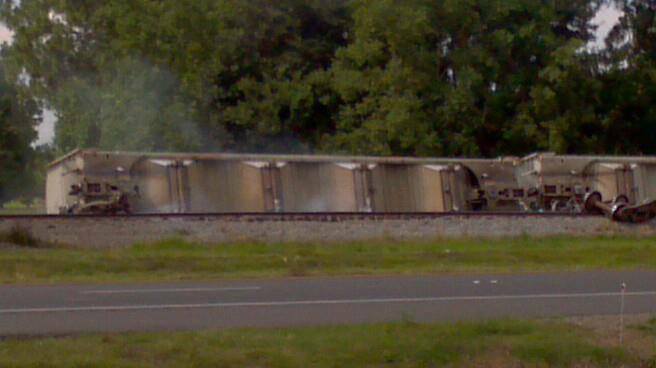 More than 20 train carriages went off tracks near Lawtell, west of Baton Rouge, at 15:30 local time on Sunday. The engineer and conductor were not hurt. Air pollution was not detected. The extent of the damage would be known soon, state governor Bobby Jindal said. “Anytime you have chemicals leaking into the environment, that’s a serious issue,” he added. It is not yet known what caused the derailment. Raquel Espinoza of Union Pacific said another damaged carriage was carrying vinyl chloride, but it was not leaking. A man who was near the derailment sought medical attention after reporting a burning sensation in his eyes, Raquel Espinoza said. State police said a road next to the tracks would be closed for at least two days.